I stumbled across this post on The Beauty Department a little while ago and it really stuck in my head. 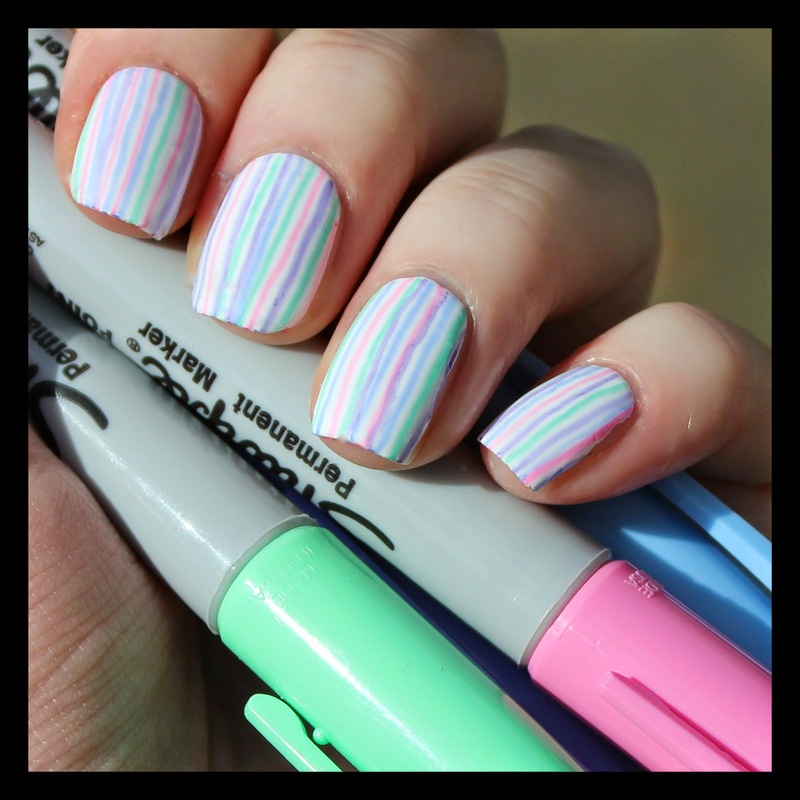 So much so that when I saw these pastel Sharpies on offer the first thing that popped into my head was how I could used them for some nail designs. This was actually my second attempt at using them on my nails as I totally effed up my first mani by using a top coat. The top coat seemed to break down the ink which was very weird so I didn't use one in this pic which is why my nails don't look quite as smooth as they could. Overall I enjoyed using these. They are thinner than nail art pens which makes it easier to get nice fine lines. However, they weren't quite the little miracle workers I had hoped. I will probably try them again though as the first mani I created was an intricate aztec one and it looked pretty good before I ruined it. Have any of you tried Sharpies on your nails? I tried with gold but ruined it with top coat - but then I found that without top coat, the pen just rubbed off... someone I think suggested hairspray once?! Love your design though, so cute! You can get the same results with gel pen, and from what I've noticed top coat only affects them a little bit. The rubbing off problem is actually great, I think. Then when I make a mistake I just wet a cotton ball and wipe it off without having to redo the entire nail!